Chopin’s luscious ‘Nocturnes’ at the West Tisbury library. Chopin’s “Nocturnes” are some of the most evocative music ever written. He was a superstar during the first half of the 19h century — Chopin’s playing and compositions were in demand in the capitals of Europe. Perhaps George Sand, Chopin’s longtime lover, describes his virtuosity best: “His music was spontaneous, miraculous. He found it without seeking it, without previous intimation of it. It came upon his piano sudden, complete, sublime, or it sang in his head during a walk, and he was impatient to hear it himself with the help of the instrument.” For pianists, the challenge is to play Chopin so that it sounds improvised. Lisa Weiss and Silas Berlin have programmed “Nocturnes” they love, approaching the task with technical expertise and imagination. They’ll perform at the West Tisbury library during “An Afternoon of Chopin Nocturnes” on Tuesday, Dec. 18, at 4:30 pm. Weiss made her professional debut with the Boston Pops Orchestra under the direction of Arthur Fiedler at age 7. She is currently a professor of music at Goucher College, where she teaches private piano, among other courses. Weiss also serves as music director for student opera and music theater productions. She has a bachelor’s degree from Harvard, a master’s degree in performance from Yale, and a doctorate in performance from Peabody. Her piano teachers include Leon Fleisher and Leon Kirchner. 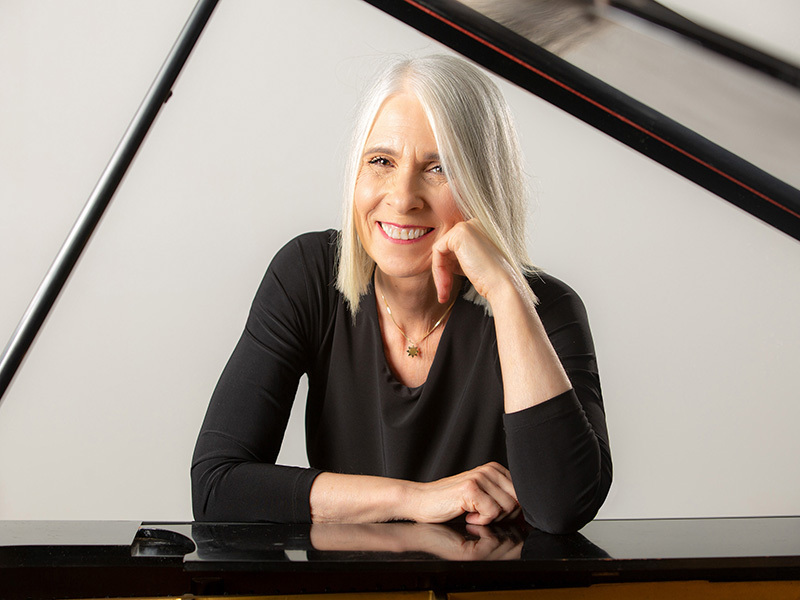 Of her New York debut, New York Times critic Will Crutchfield wrote, “A musician worthy of attention and able to hold it.” She has performed in Italy, France, Israel, the Caribbean, and many parts of the U.S.
Weiss has longtime Vineyard connections. She first started visiting the Island with her serious sailing family, docking in Edgartown, followed by a dinghy ride to town for an hour or two ashore, and then back to the boat. Weiss was unimpressed, vowing that once old enough, she would cease sailing. Vow kept. Other Island experiences have proven more pleasurable. Weiss is a regular at the Unitarian Universalist Society, and has played for events for Hospice of Martha’s Vineyard, Island Theatre Workshop, Pathways, Peace Council, West Tisbury Congregational Church, and What’s Written Within. Silas Berlin brings a jazz heart to his Chopin adventure. Raised on the Vineyard, and currently a student at UMass Amherst, he says of Chopin’s “Nocturnes,” “How do you define beauty? You can only listen, and the music speaks for itself.” One would be remiss, in this particular Island case, if Silas’ father, Jeremy Berlin, was not mentioned. Jeremy Berlin is the distinguished and well-loved jazz pianist — ubiquitous on the scene — and rightfully so. Silas says he doesn’t know anyone who is a bigger or more knowledgeable jazz fan. Silas is pleased that he’s now sharing his own jazz chops with his dad. Silas played piano from 6 to 13, studying with Lisa Rohn, who he feels has the ability to explain what the music is trying to do. “She is a lively, fun presence, and is acutely aware of what is required in the music,” he says. Silas began playing again at age 17. He said he believes coming back to the piano was an organic occurrence. His father neither pushed Silas’ playing nor objected when Silas decided to quit; Jeremy simply kept sharing his love of music. Silas is interested in the relationship between classical and jazz, and the backstories of the music. This curiosity, along with Weiss’ analytical knowledge, will make for lively interspersed commentary at the performance. Weiss and Silas Berlin got to know each other hanging out at Offshore Ale, where Jeremy is a regular performer. Weiss and Jeremy are longtime friends based on their mutual admiration. Silas found his conversations with Weiss about all things piano compelling, which led to the concept for this concert. While fairly new to Chopin’s literature, Silas finds the “Nocturnes” exciting to hear and perform. When played well, they sound like jazz, as if they are being invented as they emerge onto the keys. Weiss speaks eloquently about the complexities of Chopin’s scores. “An Afternoon of Chopin Nocturnes” at the West Tisbury library, Tuesday, Dec.18, 4:30 to 5:30 pm. Free.